Plank decking may be used to span farther and carry greater loads than panel products such as plywood and oriented strand board (OSB). Plank decking is often used where the appearance of the decking is desired as an architectural feature or where the fire performance must meet the heavy timber construction requirements outlined in Part 3 of the National Building Code of Canada. Plank decking is usually used in mass timber or post and beam structures and is laid with the flat or wide face over supports to provide a structural deck for floors and roofs. Plank decking can be used in either wet or dry service conditions and can be treated with preservatives, dependent on the wood species. Nails and deck spikes are used to fasten adjacent pieces of plank decking to one another and are also used to fasten the deck to its supports. In order to product plank decking, sawn lumber is milled into a tongue and groove profile with special surface machining, such as a V-joint. Plank decking is normally produced in three thicknesses: 38 mm (1-1/2 in), 64 mm (2-1/2 in) and 89 mm (3-1/2 in). The 38 mm (1-1/2 in) decking has a single tongue and groove while the thicker sizes have a double tongue and groove. Thicknesses greater than 38 mm (1-1/2 in) also have 6 mm (1/4 in) diameter holes at 760 mm (2.5 ft) spacing so that each piece may be nailed to the adjacent one with deck spikes. The standard sizes and profiles are shown below. Plank decking is most readily available in random lengths of 1.8 to 6.1 m (6 to 20 ft). Decking can be ordered in specific lengths, but limited availability and extra costs should be expected. A typical specification for random lengths could require that at least 90 percent of the plank decking be 3.0 m (10 ft) and longer, and at least 40 percent be 4.9 m (16 ft) and longer. Select grade has a higher quality appearance and is also stronger and stiffer than commercial grade. Plank decking is required to be manufactured in accordance with CSA O141 and graded under the NLGA Standard Grading Rules for Canadian Lumber. Since plank decking is not grade stamped like dimensional lumber, verification of the grade should be obtained in writing from the supplier or a qualified grading agency should be retained to check the supplied material. To minimize shrinkage and warping, plank decking consists of sawn lumber members that are dried to a moisture content of 19 percent or less at the time of surfacing (S-Dry). 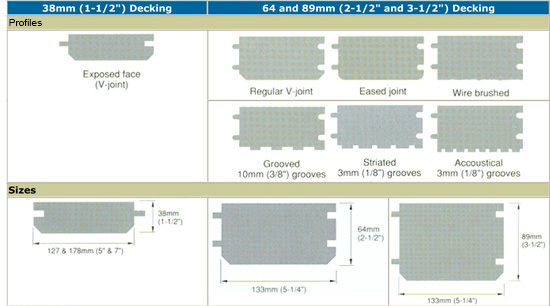 The use of green decking can result in the loosening of the tongue and groove joint over time and a reduction in structural and serviceability performance. Individual planks can span simply between supports, but are generally random lengths spanning several supports for economy and to take advantage of increased stiffness. 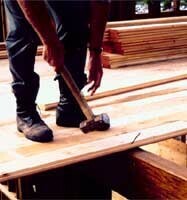 There are three methods of installing plank decking: controlled random, simple span and two span continuous. A general design rule for controlled random plank decking is that spans should not be more than 600 mm (2 ft) longer than the length which 40 percent of the decking shipment exceeds. Both the latter methods of installation require planks of predetermined length and a consequently there could be an associated cost premium.